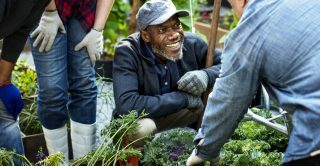 Feeling ‘green’ seems to make people happy, but doesn’t necessarily translate into positive, environmentally friendly, actions according to new research which uses longitudinal data. Believing in environmental values boosts life satisfaction, but the latest research shows this boost is mostly due to self-image (i.e. one’s own assessment of how environmentally-friendly one’s behaviour is) rather than concrete pro-environmental behaviours such as conserving water, recycling, etc. Professor Martin Binder from Bard College Berlin used two waves of Understanding Society data to study subjective assessments of one’s perceived lifestyle, one’s attitudes toward climate change and environmentally-friendly behaviour, as well as 11 self-reported variables on the frequency of green behaviour (e.g. saving water, using public transport or recycling). Only 2% of people interviewed state they are doing everything in an environmentally friendly way in contrast to 7% who are doing nothing at all. Females are more highly represented in the more environmentally-friendly self-image categories than males. Some green behaviour was vastly more popular than others. Only about 2% of the environmentally-friendly individuals in the sample leave the tab water running while brushing teeth, whereas 65% never take fewer flights, 53% never share their car and 50% never do not purchase something because of its packaging. Some of the ‘harder’ eco behaviours impose rather large constraints on an individual and mean a real sacrifice. Furthering environmentally-friendly lifestyles and establishing green habits might be easier if one focuses first on the less costly behaviours before then tackling more costly behaviours. For unemployed people, the researchers found significantly higher values for such green behaviours (using public transport, taking fewer flights, sharing a car) than their employed counterparts. One reason for this is being without a job relaxes time constraints for environmentally conscious behaviours and makes these less costly than when being in a (time) demanding job. For the retired individuals in the sample, regarding car sharing and flights, they scored worse than their employed comparison group. People with bad health and families with a large number of children (3+) are also negatively impacting on the amount of green behaviour. This could be explained with mobility (disability) and time (children) constraints that individuals face, making it difficult to do more.